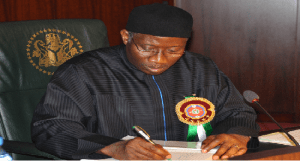 President Goodluck Jonathan has signed two bills recently passed by the National Assembly into law, one of which prohibits female circumcision. The new Acts are the Violence Against Persons (Prohibition) Act, 2015 and the Immigration Act, 2015. Spokesman for the President, Dr Reuben Abati, confirmed the development to reporters in Abuja on Monday. The Senate had on May 4 passed the Violence Against Persons (Prohibition) Act, 2015 into law. The Act prohibits female circumcision or genital mutilation, forceful ejection from home and harmful widowhood practices. It also prohibits abandonment of spouse, children and other dependents without sustenance, battery and harmful traditional practices. The signing of the bill into law is coming four days to the handing over of governance to a new administration.